Education system of Georgia has undergone sweeping modernizing, although controversial, reforms since 2004. Education in Georgia is mandatory for all children aged 6–14. The school system is divided into elementary (6 years; age level 6-12), basic (3 years; age level 12-15), and secondary (3 years; age level 15-18), or alternatively vocational studies (2 years). Students with a secondary school certificate have access to higher education. Only the students who have passed the Unified National Examinations may enroll in a state-accredited higher education institution, based on ranking of scores he/she received at the exams. Most of these institutions offer three level studies: a Bachelor's Programme (3–4 years); a Master's Programme (2 years), and a Doctoral Programme (3 years). There is also a Certified Specialist's Programme that represents a single-level higher education programme lasting for 3–6 years. 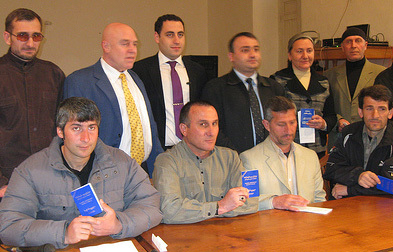 As of 2008, 20 higher education institutions are accredited by the Ministry of Education and Science of Georgia. Gross primary enrollment ratio was 94% for the period of 2001-2006.